Its hard to believe its been fourteen years since Shannons "Let The Music Play" hit the airwaves in the summer of 1984. 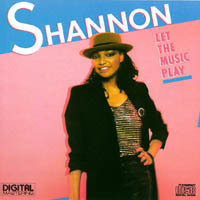 The first in a string of Shannons hits of the mid-late 1980s, "Let The Music Play" shot to #1 on the Dance and R&B charts, and to #8 on the Pop chart. "When I recorded Let The Music Play, it happened quickly," says Shannon of her early success. "Someone that I knew who was a friend of Mark Liggett found out that Liggett and Chris Barbosa were looking for a singer," she recalls. "I went down for an audition and Liggett and Barbosa took me into the studio the same day and I laid down the track for Let The Music Play."
With the phenomenal success of the single, the teenage Shannon was asked to go out and perform the song on the club circuit. "Funhouse was one of the places I performed in," says Shannon of the early track dates. "I remember it was with Madonna. She was headlining and I was opening, and people were asking my press agent, Is that Madonna?" Both unknowns at the time, each has made a tremendous contribution to the success and longevity of dance music. "Let The Music Play" wasnt the first of the style or sound," Shannon states. "Jenny Burton came out with a sound with One More Shot. We didnt copy the sound, but other people started to have that same idea at the same time. When Let The Music Play came out, people started to take dance music more seriously again." 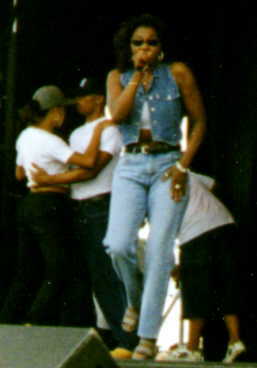 "Give Me Tonight" was recorded as the follow-up single to "Let The Music Play." "It was a takeoff of "Let The Music Play," remembers Shannon. "We tried to recreate the same thing. We used the same writers, same producers, everything." Enjoying equal success to her debut single, "Give Me Tonight" was her second smash in a row, followed by "My Hearts Divided," also off her debut album, and "Do You Want To Get Away." Its rare for a dance artist to have four singles that are considered classics, while still enjoying success as a recording artist. "It feels great; they have kept me alive all these years," says Shannon of her early recordings. Today, Shannons voice can be heard on the recent Todd Terry hit single, "Its Over Love," from his Logic Records album Ready For A New Day, and on the single "Movemania" by Sash!, to be released in the U.K. in October. In the midst of recording a new album with producers Todd Terry and Sash! amongst others, Shannon hasnt forgotten the tunes that made her famous in the 1980s. "Let The Music Play and Give Me Tonight are both going to be on the new album," she says. "Todd is re-doing them. We did a whole new thing, bringing the songs into the 90s." With a track record like Shannons, "Movemania" and her next album are sure to be hits!